Simple and elegant, these Rimini chairs will infuse your space with style. 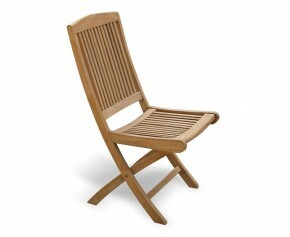 Featuring a slatted seat and back, the classic design of these teak garden chairs is sure to suit any space. Made out of the finest grade-A teak, our Rimini chairs are guaranteed to withstand the test of weather and time and can be left outside all year round for long lasting fruitful use. This teak garden folding chair makes for a brilliant addition in any outdoor space and has been expertly constructed in heavy duty A-grade teak to ensure durability and trouble free pleasure for years to come. A popular choice of teak garden furniture, this Rimini teak folding garden armchair combines the benefits of practicality and style and would look stunning in any outdoor setting. Expertly constructed in plantation grown, grade-A teak in the traditional manner of mortise and tenon joints, this Rimini teak folding garden armchair has been built to last. These Rimini chairs are wonderfully practical and can fold up for easy use and storage. Our teak garden chairs come with or without armrests, so you can choose which style fits your purpose best. 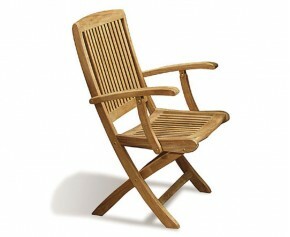 When teamed together, these teak garden chairs will look charming as an attractive focal point. View our rang of Rimini chairs.